A young star wields a double-bladed lightsaber of its own creation in this infrared image captured by NASA's Hubble Space Telescope. A powerful lightsaber slices through the dark clouds of dust and gas that surround it. 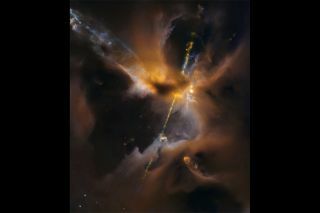 It's not a scene from the new "Star Wars" movie but an image captured by NASA's Hubble Space Telescope. Formed by material falling onto a newborn star, the two beams of light shoot outward from their star at supersonic speeds to create the two jets that look like the double-sided lightsaber wielded by Darth Maul in "Star Wars: Episode I – The Phantom Menace." As the powerful jets collide with surrounding material, they create curved shock waves at their ends. These create tangled, knotted clumps of material called Herbig-Haro (HH) objects, according to a statement from the European Space Agency (ESA). The HH object in the new Hubble image around the young star is known as HH 24.These supersonic shock fronts then heat the surrounding gas to thousands of degrees Fahrenheit, ESA officials say. This image shows the Herbig-Haro object 24 and the surrounding sky as it is seen from telescopes on the ground. The double jets of this cosmic lightsaber are unusually short for these types of objects, stretching less than a quarter of a light-year from end to end, or about 1.34 trillion miles (2.15 trillion kilometers), according to a 1996 research paper announcing the discovery of the jet. The jets also appear to have a closer interaction with the surrounding region compared to similar objects. These two characteristics suggest that the jets, which last only a few thousand years, formed rather recently. The young star lies not in a galaxy far, far away, but within our own Milky Way galaxy, clawing its way to life just over 1,350 light-years away in the constellation Orion. Barely visible in the image are smaller jets, created by more newborn stars. In fact, this is the densest concentration of HH jets known in such a small region, ESA officials said. Another view of HH-24, taken by Hubble. The Hubble telescope took the images of the region in infrared light, allowing the telescope to pierce the veil of gas and dust surrounding the newly formed stars and thus capture clear views of them.